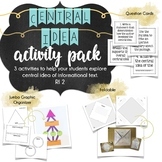 Two foldables (table and flip) for main idea and supporting details, along with 2 worksheets for main idea and supporting details. 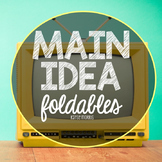 RI.3.2 - Main Idea Foldable for Interactive Notebooks FREEBIE! 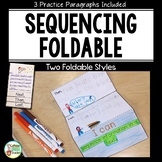 This foldable will glue into student journals easily and allows for students to focus on each piece of determining and supporting the main idea of a story one at a time. Students are asked to record underneath of each flap the main idea and three supporting details. 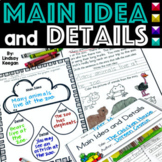 After reading or listening to a book, students are asked to write down the title, author, setting, characters; as well as the main idea and 3 supporting details. 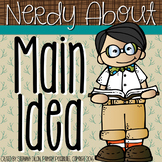 This is a great foldable to use with the Daily 5 after read to self, read to someone, or listening. 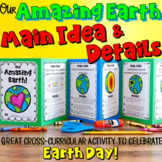 This is a foldable that goes over all the parts you use to find the main idea of an informational text. Print it, cut out the flower, then have students fold over each flap. 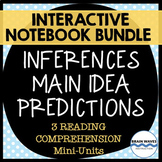 It goes in their interactive notebooks. 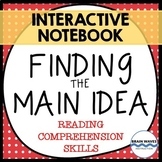 This foldable is great to work with students on coming up with key ideas and main details for chapters in a novel study. 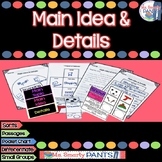 This is a graphic organizer and foldable for teaching main idea and supporting details. 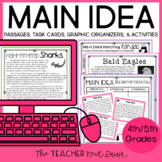 Foldable activity on main idea and details about spiders. Foldable for main idea and details.